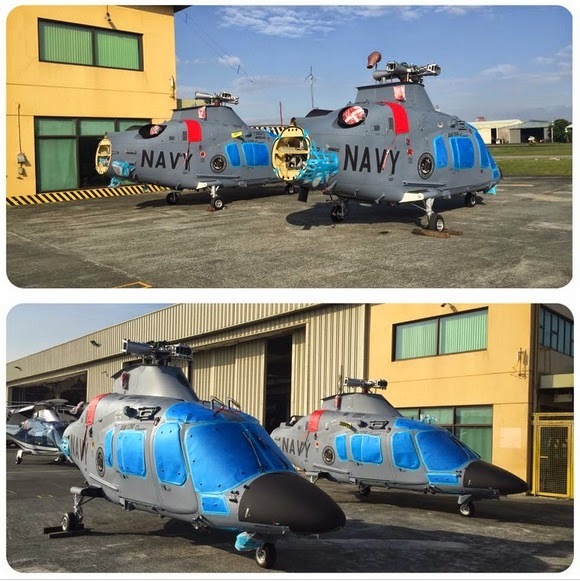 MANILA -- The Philippine Navy (PN) has Announced that its two armed AgustaWestland AW-109 "Power" helicopters will be commissioned during its 117th anniversary on May 27. "We're hoping to commission them by our anniversary this May," Navy spokesperson Col. Edgard Arevalo said in a message to the PNA on Sunday. The two armed AW-109 airframes arrived in the country last December as part of the five-helicopter deal, worth PhP1.33 billion, signed by the Philippines with AgustaWestland in early 2013. Three of the AW-109s were delivered and commissioned on Dec. 22, 2013. The armed versions of the AW-109s will be armed will have machine guns, 20mm cannons and possibly with air-to-ground rockets. The AW-109 has established itself as the world's best-selling light-twin helicopter for maritime missions. The ability to operate-from small ships in high sea state enables the AW- 109 to perform its mission when many others helicopters would be confined to the ship's hangar. Over 550 AW-109 "Power" and the AW-109 light utility helicopters have been ordered for commercial, parapublic and military applications by customers in almost 50 countries. The Philippines receives five AgustaWestland AW109 Power helicopters for its navy. The two armed aircraft are currently undergoing assembly before commencing flight tests. The AgustaWestland AW109 naval helicopters worth Php 2.2 billion funded jointly by the AFP Modernization Program and Department of Energy.